Mexican Street Foods are for the most part, quick and easy to prepare using simple ingredients with big flavors. 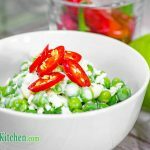 This recipe for Low Carb Mexican Peas is our Keto version of the popular Mexican Street Food Esquites. The hot peas melt the butter and sour cream into a delicious sauce, it's so good that you'll be licking the bowl! Melt the butter in a heat proof bowl, add the sour cream. lime juice, chilli powder and half the feta cheese. Mix well and set aside. Put the water and salt into a pot and bring to the boil. Add the peas and boil for 3 minutes, until cooked through. Drain the peas well and add to the sour cream mix. Stir until the mixture has melted and the peas are coated. Serve the peas sprinkled with the remaining feta. Enjoy!